Brats and burger talk is somewhat of a rarity around here, and it's not because I don't enjoy them. For whatever reason, my grilling tends to be...out there. That said, sometimes there is nothing better than a fat juicy burger. 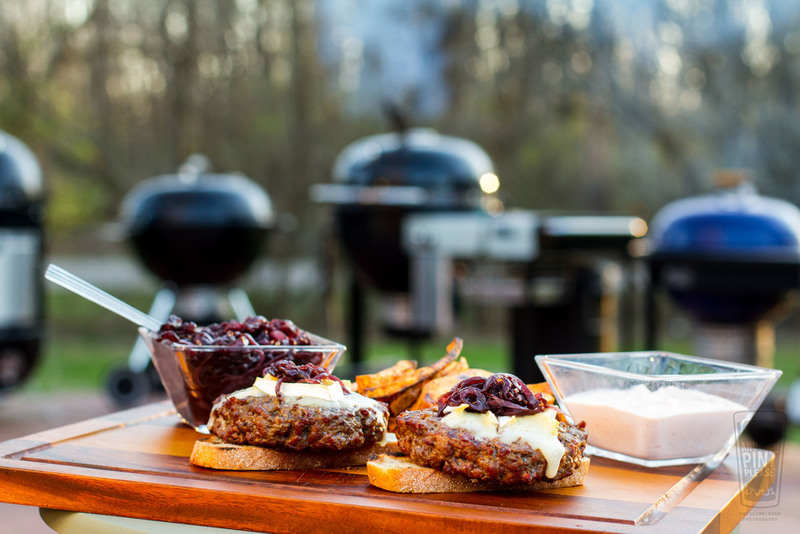 Add in some crazy toppings like brie and red onion jam because even the burgers I grill need to be...out there. This recipe comes from Weber's Big Book of Burgers by Jamie Purviance. It's a fantastic resource I find myself repeatedly drawn to, as his take on hamburgers is far from the pedestrian and mundane fare you typically see. It's my kind of "out there" grilling. Preparing the jam is a perfect use and excuse to fire up the side burner. 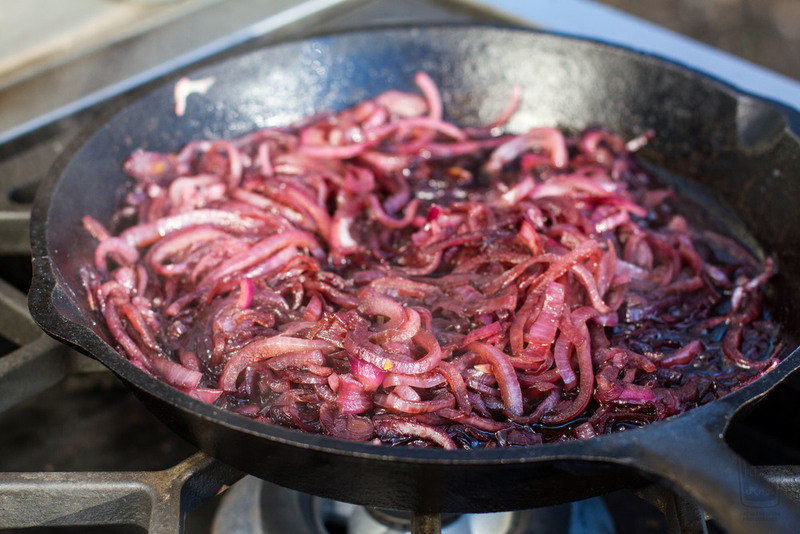 When I have to prepare something commonly made on the stovetop, I'm going to find a way to make it outside, as I want to minimize my trips in and out the back door. With a large cast iron skillet, warm the olive oil over medium heat. Add the onions and sugar and cook until soft. Figure about 15 minutes, stirring every so often. Add the wine and vinegar and cook until almost all of the liquid has been evaporated. Think: jam. Salt lightly and keep warm. Yes, you can buy ground chuck at the store. However, I almost always grind my own meat. In fact, I can't recall the last time I didn't grind my meat for a recipe. Armed with my 30-year-old Kitchen Aid meat grinder attachment, it's a simple process where I can guarantee the quality of the meat going into my burgers. For an 80% lean blend, figure approximately 1 pound of beef chuck and 1/2 pound of short ribs for a "beefy" bite. The two keys to grinding are keeping the meat cold and the grind slow. Cut the meat into inch sized cubes, or smaller, and place them in the freezer for 30 minutes before grinding. Keep the blender speed on slow. I go back and forth between making patties with my hands or with a press. Here I opted for a press because I wanted a thicker patty. Other times, hands are just plain easy. No matter the method you choose, be sure to press a dimple into the bottom of each patty. It doesn't matter if you use a spoon, your thumb, or your elbow, the dimple keeps the burger from swelling up or creating something from my childhood known as meatballs. Prepare the grill for direct medium-high heat. The Weber Summit Charcoal Grill is perfect for a two zone fire, much like my 26.75-inch kettle, I've got a ton of grilling real estate. Even though we are grilling over direct heat, an indirect "safe" area is always a good idea for when things go...awry. Butter the rye bread and season the patties with salt and pepper. Grill the patties about 10 minutes, turning once, or until the internal temperature reaches 160 F with an instant read thermometer. Add the cheese during the last few minutes of the cook. Toast the bread, very quickly, over direct heat. Watch out, it can burn fast. Load up the burgers with the jam and serve. For the record, I couldn't get enough. Note: While I do paid work for Weber, this post was all me.